I want to talk about giving your dog a great quality of life. This is a subject that is near and dear to my heart, and based on my experiences over the past decades of living with and working with dogs, wolves and other animals. Quality of life is not just about meeting an animal's physical needs, but it's mental, emotional and behavioral needs as well. That means giving the animal species specific things to do, things it would enjoy and find rewarding. It is stimulating it's mind, body and emotions in a positive way. Most good zoos and wildlife parks have learned how important enrichment is for their animals. We talk about "species specific" behaviors and try to give captive wildlife as many chances to engage in them as we can. Species specific behavior means things the animal would do naturally. Domestic animals also benefit from plenty of opportunities to engage in such behaviors as well. Giving them time to exercise their bodies and minds in ways they find enjoyable not only improves their physical fitness, but their overall well being. Think how good you feel after spending the day doing your favorite activity. Dogs and other animals are no different. Many of the animal welfare laws talk about what kind of physical needs must be met, for food, water and shelter, vet care and sometimes climate control. But if that is all that is done for an animal, I believe it is far from enough. Think of a person in solitary confinement in prison. They may have food, water, a bed and shelter, but may go crazy from isolation or boredom. Kenneling a dog is not much different, especially if the kennel is small, boring and used full or almost full time for the dog. I see so many people getting an Aussie or any animal based on appearance, or a whim, not taking into consideration what the animal's needs will be, nor how well the person may be able to meet them. I guess the first question I ask when someone wants a dog is "what is in it for the dog?" Not to say you can't want a dog for the benefits to you, such as companionship, an exercise or working partner, protector, entertainer and so on. But can you give the dog good DOG things to do as well? Are you going to be able to put the time and effort into meeting the dog's need for exercise, training and socializing, health care, diet and mental and emotional well being? This is particularly true when people get a lot of dogs and keep them in kennels, pens or crates, or tied out all the time. Or they just have one dog who is confined to a pen or chain in the back yard, and doesn't have much or any time spent with it. To me, that is almost like putting a prisoner in solitary confinement for his whole life. In the dog's case, he isn't even a law breaker, just a victim of an uncaring or unknowledgeable owner. I know we can't spend 24/7 with our dogs, but if we can give them quality time each day, we can fulfill their needs too. Animals that don't have an appropriate outlet for their instincts and energy are going to become neurotic or develop many behavioral problems, not to mention they won't have a very good life. It can even lead to ongoing stress which in turn can lead to poor health. There are various places you can find studies and other information on this subject, and you can also talk to experienced dog trainers and behaviorists to find out what kinds of adverse behaviors they see in dogs who are kenneled or crated too much. The same goes for dogs stuck in shelters too long. They sometimes become unadoptable after becoming neurotic and aggressive from the stress of kennel life. I have seen it first hand many times over the years. In my case, I am blessed to work from home. Even on busy weeks I have the flexibility to take some time off almost whenever I want, to do fun dog stuff. My dogs are house dogs first and foremost, in the sense they live inside, but they also spend a lot of time outside working and playing, participating in almost everything I do. My yard is huge and is set up with a number of things designated for doggy fun. These include several large wooden platforms to play on or under, a wading pool in warm weather, lots of trees and lots of space to run as much as they want, dig and just hang out. I also provide a lot of toys that they can use to engage each other or me. I also take them places to add variety to their socialization, play and exercise time, and being Aussies, they LOVE that. They love group games of fetch and get a lot of exercise that way. The best part of their day is the time I spend with them, as this breed really thrives on a lot of quality time with their people, being that work or play. I could never keep them crated or kenneled all the time, as I know how much they would be missing out. They would not be able to reach their full potential. I relish that one on one bond they form with us and hate to waste that potential. Whether you have one dog or a dozen, being able to provide that wholesome kind of life is great for the dogs and their owners. You can see on a few of my photo pages some of the fun things we do with the dogs, such as going to the pond at my Mom's house, or hiking on a friend's property, and other such fun outings. My dogs all get excited whenever they see me pick up the keys to the truck. We load everyone up and head off for fun and adventure! I would never want more dogs than I can take on these outings, as it is a huge part of the quality of life for all of us. Check out the SUMMER and SNOW FUN PHOTOS, MORE SUMMER FUN PHOTOS, A DAY AT THE POND, ANOTHER DAY AT THE POND, and the 3 FUN PHOTOS pages to see some of the things we do on a regular basis with our dogs. 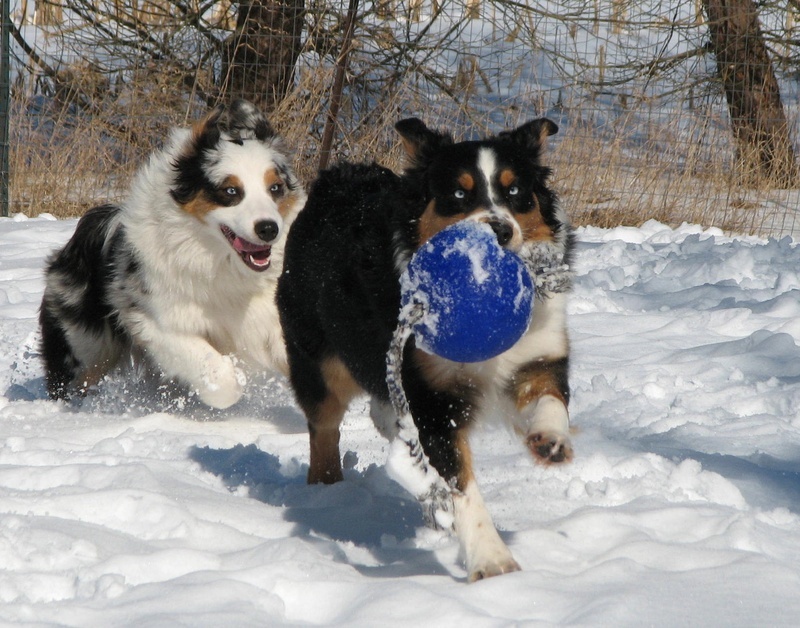 Other folks may enjoy doing more organized activities, such as agility, tracking, rally, herding or other "dog sports." Many Aussies are still used on farms and ranches as true working dogs, and I imagine those are some happy, fulfilled dogs! Since Aussies are a working breed who enjoy having a "purpose", finding things to do with them, even if it's not traditional stock work, will go a long way toward keeping your dog's needs met. I think the biggest purpose of this page is to get people to look at life through their dog's eyes. He is not a human in a fur suit, but is a dog with drives and needs that are specific to his species and in this case his breed. In doing all we can to understand and meet those needs, we will have a much more happy, healthy, balanced dog. These are a few pictures of our dogs having fun, living life to the fullest, and at the end of the day, relaxing in the house. There is no better life for an Aussie! They are a part of our daily lives, join in almost all we do, and then hang out with us and relax at the end of the day. Even the puppies have a blast! In the photos below, I got out the hose so the dogs could play in the water! They love it, and it is a way for them to get exercise and entertainment even in hot weather. Our dogs love playing in our pond! "The righteous man has regard for the lives of his animals."